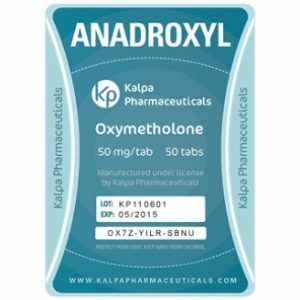 The steroid Anadroxyl is an oral steroid which contains Oxymetholone, which is a chemical substance that assists in allowing you to gain strength, appetite, body weight and the red production of red blood cells. The drug allows athletes and bodybuilders gain muscle. It is used to gain mass and is nowadays known as one of the most popular oral anabolic steroids. Anadroxyl is also used by weight lifters for heavy weight lifting. Anadroxyl has a very fast effect that offers fast and noticeable gain in muscular mass. The drug also helps the body to restore faster and gives the sensation of overall energy. This is the most asked question, but the answer to this is very simple. The reason being it increases the amount of red bloods cells that allow the muscles to absorb more oxygen. To explain that, I will give you an example, the athlete can feel great power and strength even after several sets. When taking Anadroxyl you will feel a wonderful and satisfying sensation, this also helps to stimulate the body help you regenerate faster. Just hours after you’ve done some hard training, you will feel that you are ready for more. It is advised on the bottle that the daily dosage of Anadroxyl is in the range of 0.5 – 0.8 mg per body weight. It is also advised for them who have never taken any type of steroid before to make sure they limit the dosage to 50 mg per day and then after a week they can increase the dosage to 100 mg per day. While it’s common for bodybuilders to suspect that Anadroxyl would be an even riskier choice for use by women than most anabolic steroids, actually the reverse is true. Medically, once per day dosing of 50 mg/day over extended periods has shown only a moderate rate of virilization problems. The same certainly cannot be said of Anavar, Dianabol, or Winstrol (stanozolol.) While not necessarily sufficient for high level female bodybuilding competition by today’s standards, such a dose actually is considerably more than needed by most women for excellent results in adding muscle, losing fat, and generally improving their physiques. Half this dose — 25 mg/day, preferably taken as divided doses — is very effective and is so far as I know the lowest-risk way to obtain this degree of benefit from anabolic steroids.